The festivities are over, which means that all of your fancy New Year resolutions have been broken at least a couple thousand times. A New Year’s miracle seems to have happened here in cryptoland, however, as collaboration and partnership seem to be part of the 2019 mood. We’ll let you know about all of these collabs, along with other highlights of the week and the most expensive NFT items (as always, courtesy of nonfungible.com. You already know, it’s time for Gameunculus’s Choice! Interoperability has arrived to these games, in the way of crossover special-edition NFTs. To test one of the blockchains coolest features, these two games are collaborating to create three of the cutest — and oh so almighty — Kitties out there. Aeoncat, Hypurrion and the Fancy Cat Tally are the limited edition purry friends that have descended from their mounts to bless us all in their cool ways. In Gods Unchained, the Kitties will manifest themselves as unique statues if you purchase the “Cat in the Pack” cards set. If you manage to breed the ultra rare Tally, you can forge it into an exclusive custom-built talisman. This cool partnership came in motion this week and you can find out in which dates you can get — or try your hardest at least — one of these three exclusive divinities here. Those darned Cuties always have something up their sleeves, don’t they? It seemed like things were less than perfect for them regarding their TRON integration (which we covered in our rad article about TRON in crypto gaming, to the point that the Cuties team acknowledged the develompent hiccups and promised to work in providing a better experience. It seems like that didn’t take too long, as the Cuties players on TRON have already discovered their first exclusive Tribute Cutie. The design of this Cutie was inspired by Umka, a Soviet animated classic. This is definitely exciting to hear, but all the credit must be given to the player who discovered this. Let’s hope that the dev team deliver on their promise to “perfect TRON integration” in 2019. My Crypto Heroes convinced their friends at Etheremon to share some of the mons with them. From January 11th till January 18th five different mons — including the legendary Zedakazm — can be found in My Crypto Heroes adventure nodes. Though these mons are pixelated (as any item and character in My Crypto Heroes universe are), they’re still easily recognizable and might turn into a real asset for the luckiest players. The mons will act as normal extensions, they can strengthen your hero, so why don’t you rush to adventure nodes and try to find one, or a couple? Gameunculus will provide the details. And hurry up, cause despite the fact that My Crypto Heroes has banned over 500 accounts this week due to the violations of their terms of service, there are still hundreds of players on the loose. During the last couple of weeks, we’ve been releasing an interview with Artem, also known as CryptoZombie, from CryptoGamingPool in three separate parts. Gameunculus had the pleasure of interviewing a guy who has been hard at it for years. After being heavily involved in the CS 1.6 and Quake 3 Arena scenes, this guy got into crypto and now regularly plays games and helps devs with testing. In this interview, Artem discusses his experience, his strategy, tips for starting players, and many other age-old questions that players have. Even if you’re convinced you’re Mr. Crypto Hotshot, you’ll definitely learn a valuable lesson or two reading this interview. Come and check the first part! If you’ve been on the lookout for a easy and safe way to trade your crypto collectibles, or if you’ve ever been afraid that you’ll get scammed during a simple NFT transaction, then Boxswap is for you. Boxswap takes care of your trading needs by swapping your assets in an scam-free environment. All you gotta do is make a swap on your own terms on their website, send the link to whoever is interested in that swap — or post it on social media, and then wait for a counterparty to finalize the deal with the link you’ve sent. It’s so easy it should be illegal! But it is legal. And legit. And safe. Check out the piece that we wrote on Boxswap for all the sweet swappy details! The best-sellng item of the week, for the second week in a row, is a CryptoKitty. In fact, it was the 1,000,000th Kitty! This gen 2 purry friend is quite literally on fire, and being the millionth Kitty must have its perks, since there were only 20 chances to breed this volcano cat, and this was the last one with these fancy traits. 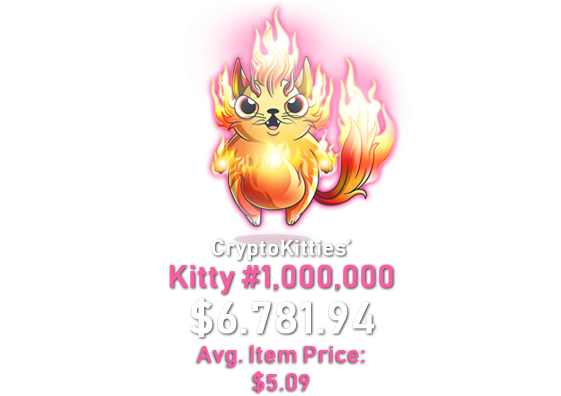 This little buddy was sold for 44,941 (ETH), which makes up for a whopping $6.781, making it the most expensive Kitty we’ve covered in Gameunculus's Choice. When you consider the humongous amount of transactions that the Kitties had during the last 7 days (10.242), added to the affordable average price of each Kitty (only $5.09, very little compared to Decentraland’s $736.09 and even Etheremon’s $18.26), then it becomes clear that the Kitties were the big winners this week. Decentraland has to settle for the second spot for a second week in a row. At least, the difference between the average item price and the price of this particular parcel of land is bigger than last week’s. The selling point of this parcel is, once again, that it is closer to a road (3 parcels away this time) and that it is almost adjacent to a the fashion district, which “brings top fashion brands” into the DCL experience. Funnily enough, two other transactions for this same parcel of land took place after this transaction, but they were for considerably less money. In fact, not even 24 hours after this transaction for $1,888.30, the parcel was sold again, but this time for only $880.24. It was then sold once more, this time for $1,139.37. That’s rough. It’s a little mouse!!! Yeah, it has a bomb that’s about to explode attached to its back. But whatever, it’s a little mouse!!! This little fella crawled its way to the third spot, and deserverdly so. Imagine if Pokémon were a MMO game. Wouldn’t you think that the very first Pikachu would be worth millions? This is the case for this little exploding rat. 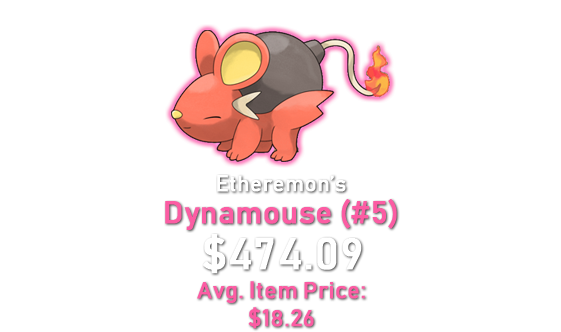 Sure, there are Mons that are rarer or more powerful, but this was the first Dynamouse ever. What makes him even more legit is that he is the fifth OLDEST Etheremon ever. Wouldn’t you say that somebody like him is worth the 2,99 ETH ($474.09)? If you are not interested in having the first Mon of its kind, then you can go to their market and buy a random one for as little as 0.12 ETH, but you know that you want the most exclusive specimen out there. That wraps up this week’s installment of Gameunculus’s Choice. It’s definitely a welcome sight to see the trends that we were becoming accustomed to shaken up every now and then, giving other games the ability to stand out in the crypto market. Do you think that Kitties will reign over supreme for months? 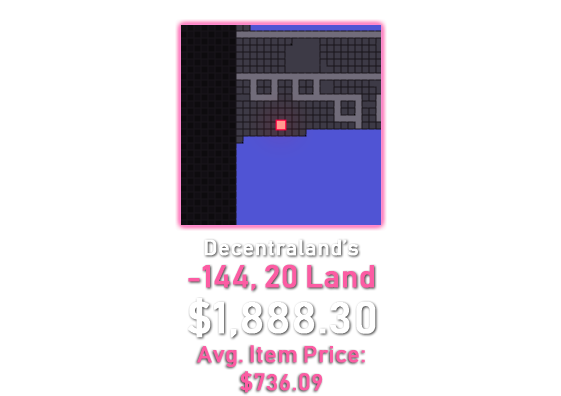 Or will Decentraland climb its way back to the throne? Make sure to tune in next week for your favorite weekly pick in crypto gaming. You can also leave your thoughts on our Twitter or Telegram!